King Harold II gave the manor of Upminster Hall to the abbotts of Waltham Abbey in around the year 1050. The present house, which dates from circa 1500, remained in the ownership of the abbey until the Dissolution of the Monasteries in 1536, when King Henry VIII gave it to Thomas Cromwell. It was then occupied by the Latham family from 1543 until it passed to Edward Noel, later 1st Earl of Gainsborough, in 1677. 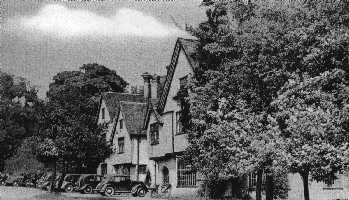 It was then owned by the Branfil family from 1685 until it was bought by Major Godfrey Pike in 1921.It became the clubhouse of Upminster Golf Club in 1927 and was listed by English Heritage as a Grade II* building on 7 January 1955. The Hall has undergone many changes during its long history. The central hall dates from the time of Henry VI. The beautiful staircase and gallery was built in the reign of Charles I. This gracious timbered manor house with its mullioned bay windows was altered and enlarged in 1937, but everything possible was done to preserve its unique character, and it has, in fact, lost little of its charm.